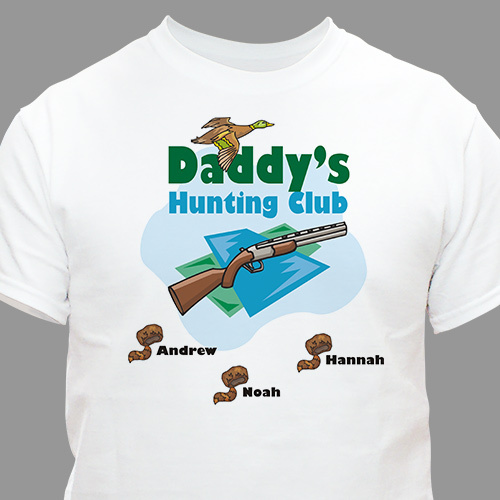 You'll be right on target with our Personalized Novelty Hunting Personalized Dad Shirts. Our Personalized Hunting Shirt is Available on our premium white 100% cotton T-Shirt, machine washable in adult sizes S-3XL. Hunting shirt is also available in a handsome Ash Gray. Hunting shirts include free personalization! Personalize your Hunting T-shirt with any title like Dad, Grandpa or any hunter's name and up to 30 children or grandchildren's names. Got this for my husband as a gift. He loved it. Our son-in-law LOVED his shirt and so did our grandkids seeing their names. They live in Maryland. We got this for my boys grandpa. He loved it. Additional Details Personalized Hunting shirts make perfect Fathers Day Gift ideas for Dad! Be sure to look at our entire collection of Personalized Fishing And Hunting Gifts for Him. These Personalized Fishing & Hunting Gifts are unusual gift selections for Birthdays, Anniversaries & Christmas.